Since my childhood I have always enjoyed spending time in nature and exploring all of the different things within it. There is very many things you will see while walking in the bush that seem to tell a lot of stories. Where I grew up is very beautiful also I am lucky to be able to wander around and see the many lakes and different landscapes. There is a wonderful presence you will feel at times while walking through the bush as though someone is watching you but in a good way. Taking the time to see all the little places in the forest with all of the various trails and marks of animals. They will keep a visible solid path from one lake to another here that our people used as canoe portaging sites also. It is very wise to move in a way that is conscious of the land and who better to follow than the original inhabitants. Interestingly is that we to will have attributes that are associated with many different animals or aspects of the natural world. From the clans were born with to even our spirit names or those helpers who will come to assist us in our lives. 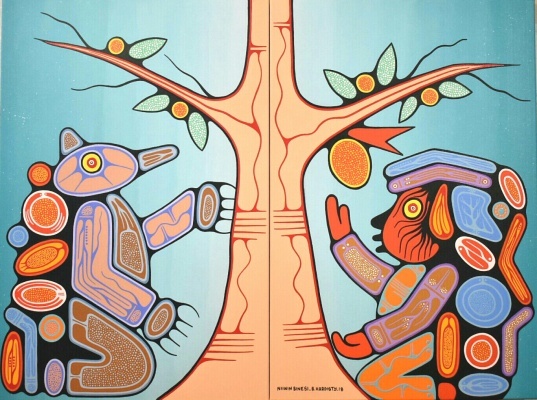 Notice how the bear is marking the tree and also the man who you see on the opposite side who is fixing a prayer tie to the tree. Both of those things are very important parts of life – marking where you were and also honouring that which helps you in return. It is so vital to be able to go and spend time in nature and not just spending time in nature but also praying and learning from it all at the same time. Everything is important and all things in existence have their special importance - even the marks we may accumulate through a lifetime as well. Hence the title of the painting is very appropriate and it is very true that these marks make us beautiful.